A complete and permanent repair solution for any pothole. This system gives the same performance as hot material. 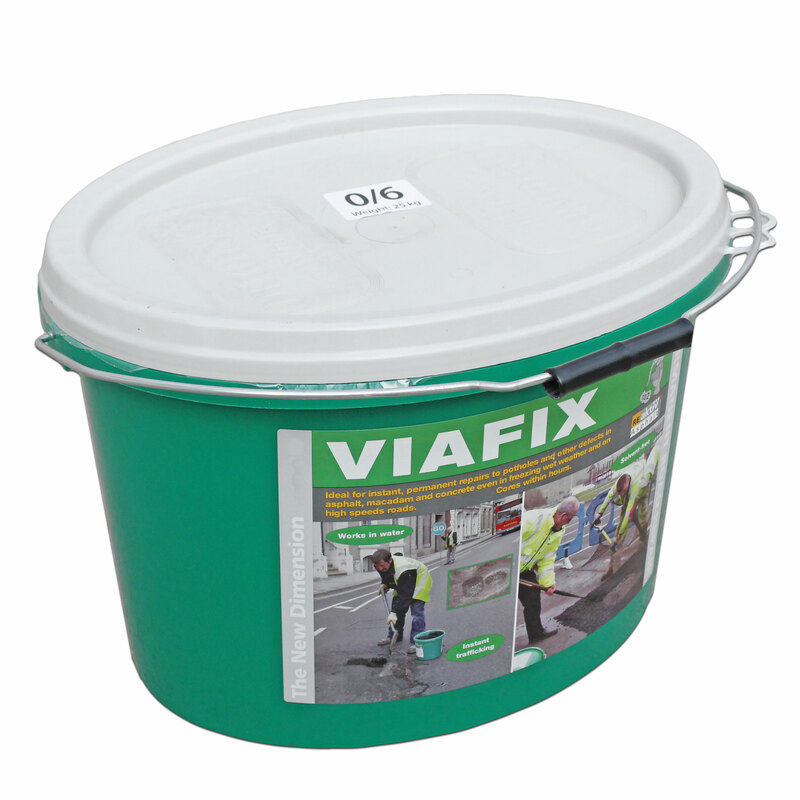 Requires no special preparation to the area, simply remove any loose debris, and then pour the Viafix in. Level the surface with a trowel, apply water and compact down for a long lasting repair. Used all over the UK to repair highway pot holes it is fast and effective! It is the ultimate instant pot hole solution. Its ability to be applied quickly makes Viafix a viable alternative to "hot repairs". Did you know Viafix has had rigorous long term tests carried out on its performance by Surrey County Council? See the lab report under 'Downloads' to see it's outstanding performance for yourself. Soak the area with plenty of water, Viafix is water activated so it works really well on rainy days or even if the pothole is full of water. Tip in the Viafix, you can pack it down manually (with a tamp or the back of a spade), or just drive over it (with your car or road traffic). So long as it is packed in before it sets you are good to go. Soak it again & open to traffic, that really is how simple Viafix installation is. Even when setting it will not stick to tyres or rut when being driven over - this means a rapid repair! Should I get the Tub or the Bag? This listing is for 6mm sized aggregate ideal for almost all applications. For small repairs, such as on pavements a 3mm nominal aggregate size is also available. Please call for a quotation. While we think this is the best instant pothole solution available, if you have any questions please call our sales team a call on 01905 794 875 to get expert advice and guidance. Colour Black, fading to dark grey over time. Shelf Life 12 months whilst sealed, 6 - 24 hours once seal is broken. Application Temperature > 0 degrees Celsius. Ground must not be frozen. Is Viafix Suitable for very shallow holes on my driveway? "Would Viafix be OK to repair my tarmac drive? The tarmac was laid about 20 years ago and in 4 or 5 places the tarmac has worn away revealing the sub-base in tact. But the holes are only about 15-20mm deep and I am wondering whether your material is suitable for such shallow depths. The total area of all these holes is about 1 square metre. If I do not treat now, there is a danger of the sub-base eroding away.Can the container be closed after use so that unused amounts remain usable? What weight of tamping tool would you use?" Yes, viafix is suitable for repairing your tarmac drive. It is suitable for shallow depths of 15 - 20mm deep without a problem. For application quantities per tub, please see the specification. If your tarmac is particularly old, we would recommend you prime the edges with our bitumen primer, product code 12577. You can close the container with the lid however there is a seal that you have to break to use it. Once opened, it is recommended that you use it within 24 hours, though you could prolong its life by covering with clingfilm or similar. This is not advised though. The tamping tool should be as heavy as you can deal with, or just use the back of a spade! How much Viafix would I need for a hole 80cm x 80cm and 8cm deep? Four tubs should be sufficient to fill this based on the manufacturers guidance. How long does it take to go off? Viafix can be used on any road surface regardless of the slope. You will need to compact it into the hole and then apply some water to speed up the curing process. Full curing takes 1 - 24 hours depending on the temperature however you can drive on it straight away. Will viafix work on gravel driveways? This is only designed for tarmac and bitumen based surfaces, so it is unlikely to be the correct solution for a gravel driveway. I'm afraid we cannot recommend using this. Yes, the Viafix is HAPAS approved. 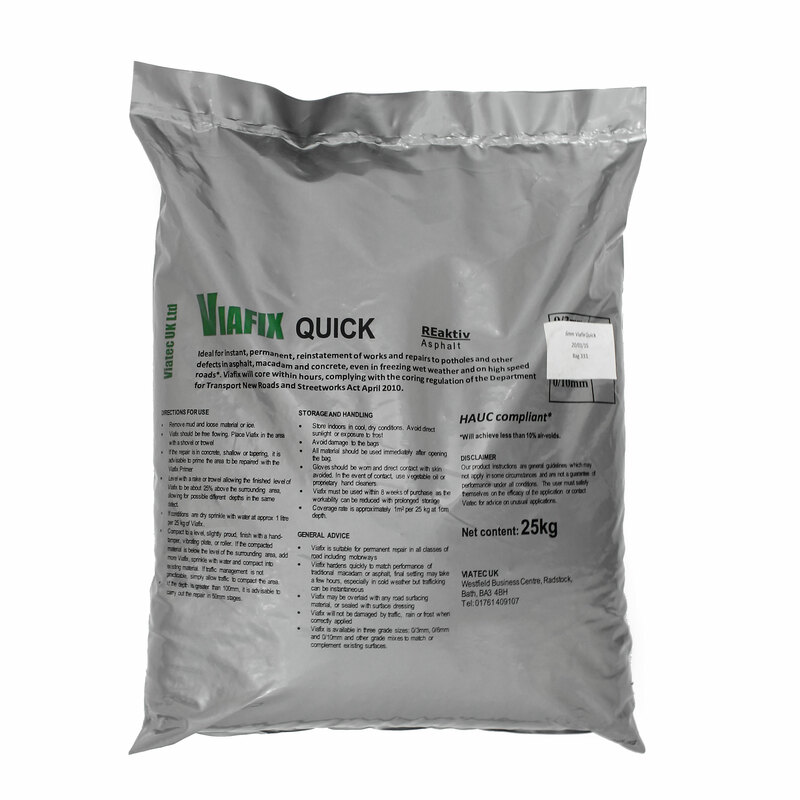 Do you need to brush out excess and loose material before applying Viafix? Hi Claire. Yes, this product does require loose debris to be brushed out before applying. As this product is water activated, a good way to remove compacted / hard mud is to pour water into the hole and after a few minutes, remove with a stiff brush. Remember this will only work as well as the surface it is bonded to - so if it bonds to loose material in the hole, it will not perform to specification. Please see the downloads tab for further information on using this product. What temperatures can you use this in? The manufacturer states that it can be used in all weathers, though because this solution is water activated, it should be used at above freezing temperatures.